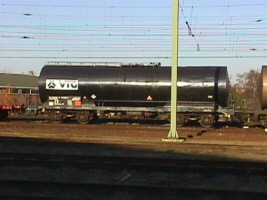 At approximately 12.15 pm on november 19, 1998 in Deventer, the Netherlands, an employee of te Dutch Railways (Nederlandse Spoorwegen) saw some white foamy stuff at the lid of a tanker rail car. 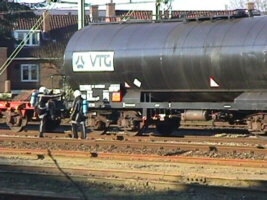 The sign on the tanker railcar indicated that it contained hazardous materials and a leakage of hazardous material was possible. 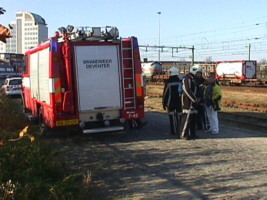 The train was directed to the shunting yard at Deventer and the hazmat incident procedure was initiated. 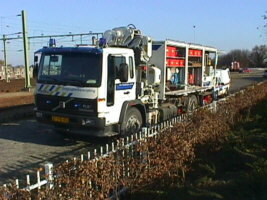 The Deventer Fire Department attended with a tanker/pumper, breathingair and Hazmat truck at the scene. 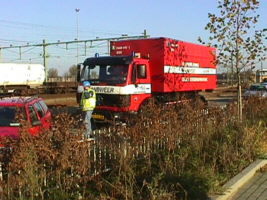 For safety reasons the Deventer Fire Department can only operate on the shunting yard with the Dutch Railways Incident Unit, which arrived 15 min later with their special railway incident truck. Hey, is the coffee ready? 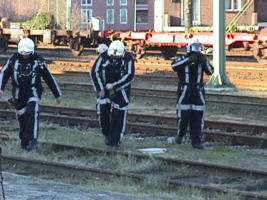 The emergency crews had to wait until train traffic had been stopped and the current of the overhead powerlines was swiched off (1500 volt DC). 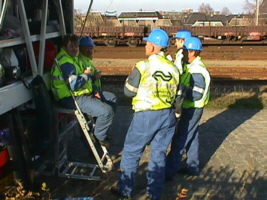 After permission of the Railways Traffic Control three fire fighters and a crew member of the Railways Incident Unit went to the railcar to inspect it for leaks of hazardous materials. Lets see what the problem is HEY !?! It's empty !!! The railcar was empty! It appeared that some build-up of snow around the lid of the railcar gave the railway employee the impression of a foaming leak. 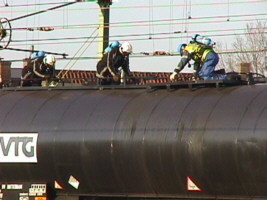 Commuter train traffic was down for several hours resulting in a big train traffic jam. AHH, time for a hot cup of coffee !! 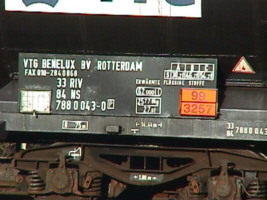 Copyright © 1998 Albert Baas.